In the US about 30 million children and teens participate in some form of organized sports, and there are3.5 million injuries each year, which cause student athletes to lose playing time.Almost one-third of all injuries in childhood are sports-related injuries.Yet, over 50% of all sports injuries in youth are preventable. Overuse or misuse injuries of a body part are responsible for nearly half of all sports injuries to middle and high school students. Improve balance, strength, coordination, and/or specific skills in the sport. Be comfortable and provide accurate data. Address conditioning and proper body mechanics. 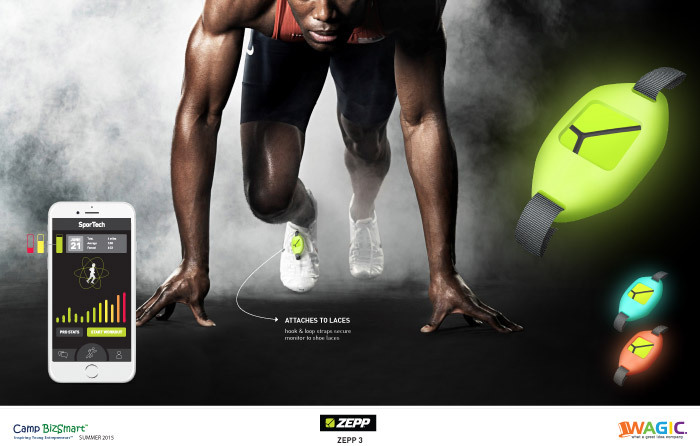 Capture all data from the device and send it wirelessly to the app. Have an application that works seamlessly with the hardware providing critical data. Turn the app into a game that helps make using it FUN and SOCIAL. Meets all federal and state health and safety requirements. Price range to drive adoption to the largest population: Retail price must be competitive with an attractive ROI. Target retail price should be $99 per unit. 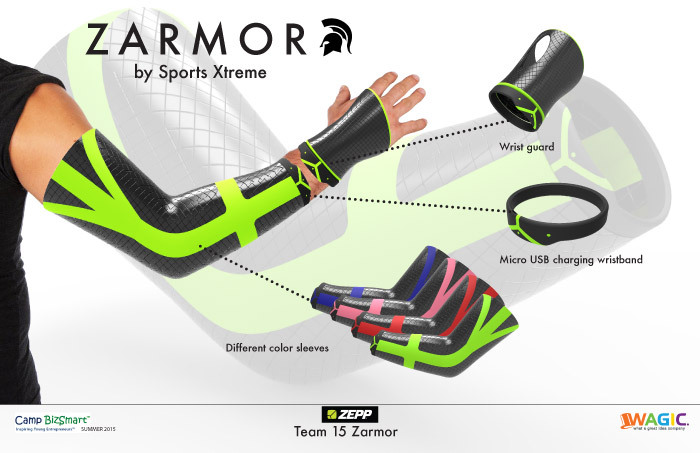 Prototype testing ready by end of the year 2015. Reduce injuries in athletes age 8-18 by 50%. Be able to walk the audience through your product “experience” as if they were a customer. Identify a specific consumer market and geographic locations where product would have greatest viability. Identify companies that would be interested in marketing partnerships. A marketing plan which identifies points of differentiation for the product, and specific marketing tactics to drive sales. A customer centric product design illustration and basic physical prototype. Marketing jingle and tagline and marketing and sales promotion strategy. Competitive analysis: the features, benefits and advantages to differentiate your product from others in the market. Pricing plan including the cost to make, to market and get to market and the return on investment (ROI). A plan for distribution of the new product. Projected benefits: reduction in injury rates, cost savings, safety benefits, health benefits and health savings. Teens across the USA are feeling high levels of stress that they say negatively affect every aspect of their lives, a new national survey suggests.Stress doesn’t just “happen,” but is a reaction our bodies have to events & things that happen to us. It is important to know that our nervous system controls functions like heart rate, respiration, and digestion that normally occur without our thinking about them. The same research reports 27% of teens say they experience “extreme stress” during the school year, vs. 13% in the summer. Stressors range from school to friends, work and family. And teens aren’t always using healthy methods to cope, finds the latest Stress in America survey that says that an appropriate amount of stress is what helps us become strong. But what is an appropriate level of stress? Research tells us the more teens understand and manage their stress, the more resilient that they become and the more control they have over their own future. Using the NeuroSky ECG-based biosensors, design a wearable device which can calculate heart rate and heart rate variability with NeuroSky’s stress algorithm to monitor in a fun and interactive way:attention, focus and well being while learning, exercising, collaborating, working or just enjoying the people around you. The purpose is to provide an enjoyable way for 11-18 year olds to learn the physical state in which they individually focus best and relax best so that it is possible to practice and return to this state as needed for best personal benefit. 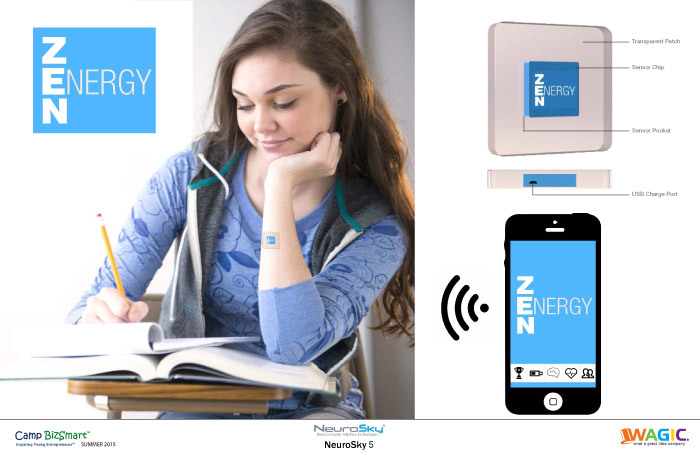 Using the NeuroSky biosensor technology create a new physical wearable device that is easy to use, moderately priced, light weight and comfortable to use. Use technology to estimate a person’s “heart age” vs. their “real age” algorithms via Neurosky technology ECG tracking. Create a fun interactive measurement tool, that could function as a game, to work these two algorithms into an app. 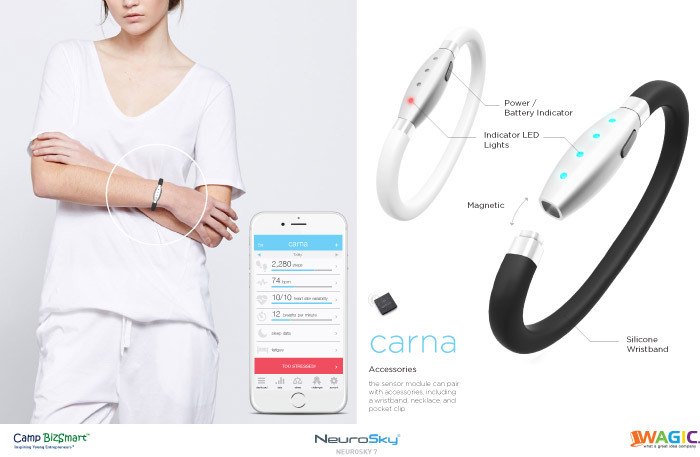 Create a “story line” design concept for a mobile app on a smart device, then pair your product design with a new next generation design of Neurosky’s LifeBeat type wrist band and biosensors. Your product should help to create positive habits to focus on an important task and to also rest and re-energize. Provides benefit to manage stress and recovery in an easy to use device. Should work with or without being connected to electricity. Use the latest smart and interactive technologies to enhance the user experience and to monitor progress. Retail price range of $129-199.00 to drive adoption to the largest population, according to features included to drive ROI. The ability to measure and track long-term trends allows individuals to identify situations, behaviors, and lifestyle choices that may affect their level of stress. Armed with this knowledge, individuals can make the right choices for successfully managing stress and achieving a healthier balance in their lives. Create a clear value proposition to students 11-18, and to parents. Fun and interactive way to get teens to enjoy using the device and app to follow their progress and engage socially in a positive way. Pricing plan including the cost to make, to market and get to market and return on investment (ROI). Projected benefits: positive personal behaviors such as productivity and satisfaction, and health benefits & health cost savings. Patients in an average hospital room are exposed to so little light during the day that their bodies cannot adopt a normal sleep-wake cycle. Researchers found the lowest levels of daytime light exposure were tied to more pain and fatigue and a poor mood. Exposure to light during the day is important for setting the body’s internal clock. To little light and too much –or exposure to light at the wrong times, such as during normal sleep times -can affect sleep quality at night and mood during the day and even more importantly slow the healing process. Light has an amazing effect on people. Used effectively in healthcare facilities, it can enhance the healing environment and play a key role in promoting the well-being of patients and staff. The more time patients spend in daylight, or artificial light that mimics natural daylight, the better it is for them. In fact, light can improve patient satisfaction, comfort, mood and quality of sleep. 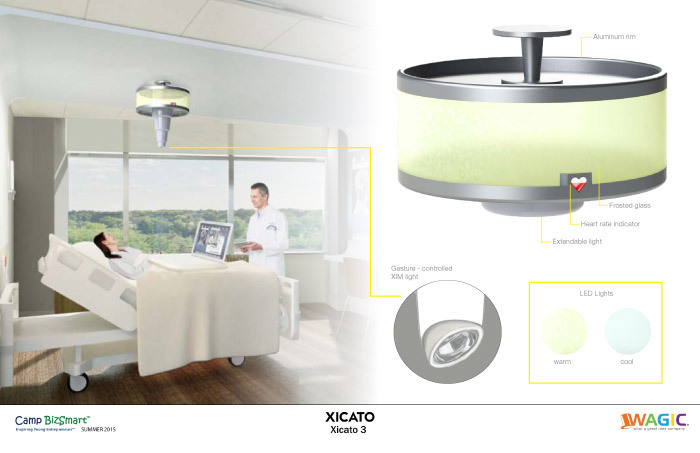 Using Xicato intelligent LED light sources, create patient room lighting to improve the healing environment, by supporting patient comfort and staff performance with light that adapts to individual needs. 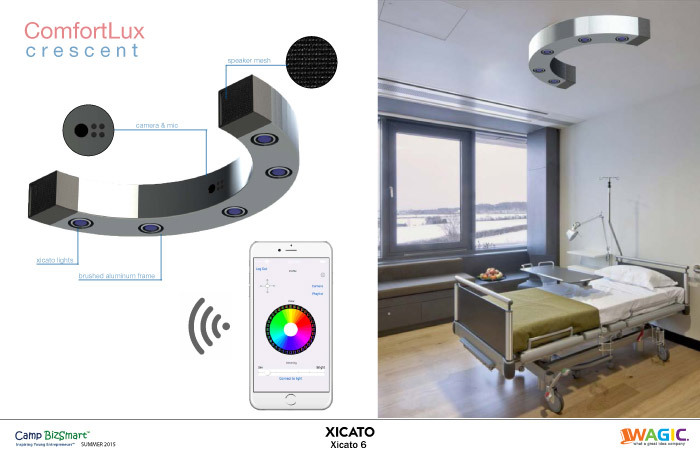 Build upon Xicato’s light sources, electronics and optics to create an intelligent light source and space for the patient room in hospitals by integrating electronics, software and connectivity. For this business case we choose to use the latest Bluetooth Smart technology, very similar to what you have in your cellphone. This allows the hospital to communicate through bluetooth with other devices for multiple purposes. Dramatically improve patient observation and monitoring,examination, and simple medical procedures. Incorporate current technologies such as blue tooth and i-beacon location capabilities. Provide smart technology communication for the lights. Provide targeted, directional light that focuses only on the spot needed. Work with or without a hardwired electrical connection. Price range to drive adoption to the largest population: Price must be competitive with an attractive ROI. Assume that, based on all the advantages of your light the average patient stays one day shorter in the hospital, explain the case for what you think the light can be sold for in USD. Retail price: do your competitive analysis and justify your price. Projected benefits: cost savings, safety benefits, health benefits and health savings, as well as patient and staff satisfaction.